56 | TH E M R EP O RT O R I G I NAT I O N S E R V I C I N G DATA G O V E R N M E N T S E C O N DA R Y M A R K E T THE LATEST GOVERNMENT Regulators Plan to Zero in on Fair Lending The CFPB will focus on redlining, mortgage and student loan servicing, and small business lending this year. A report from the Con- sumer Financial Protec- tion Bureau's (CFPB) fair lending team and the unveiling of a consumer credit trends tool have both helped to identify areas that the Bureau will be zeroing in on this year. "For the past five years, we have worked hard to ensure that consumers are not excluded from or made to pay more for mort - gages, auto loans, or credit cards because of their race or ethnicity," said the report. "Our work so far has resulted in over $400 million in payments and credits to over 500,000 consumers who experi - enced discrimination, and greater efforts by lenders to monitor their own lending practices for possible discrimination. We are proud of these accomplishments." In moving forward, the fair lending team identified three par - ticular areas they will be centering their focus on—redlining, mort- gage and student loan servicing, and small business lending. The Bureau said that it will determine whether some borrowers who are behind on their mortgages are having more difficulty coming to a solution with their servicer due to their race or ethnicity. "Because the Consumer Bureau is responsible for overseeing so many products and so many lenders, we re-prioritize our work from time to time, to make sure that we are focused on the areas of greatest risk to consumers," the report added. In addition to these initiatives, the CFPB's Consumer Credit Trends tool was unveiled to track originations for mortgages among other consumer lend - ing metrics to forecast potential future risks. Looking forward, the CFPB plans to include other consumer credit products and information on credit applica - tions, delinquency rates, and consumer debt levels. "Our Consumer Credit Trends tool can chart the state of consumer markets," said CFPB Director Richard Cordray. 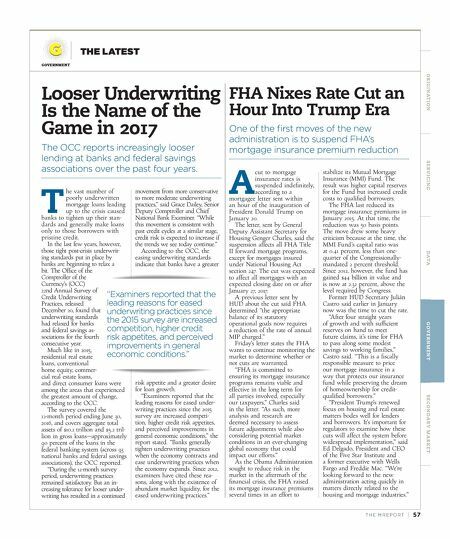 "This critical information will help us identify and act on trends that warn of another crisis or that show credit is too constricted." With the aid of this tool as well as forward thinking from the Bureau's various divisions, the CFPB is continuing its goal to "help consumer finance markets work by making rules more effective, by consistently and fairly enforcing those rules, and by empowering consumers to take more control over their economic lives." 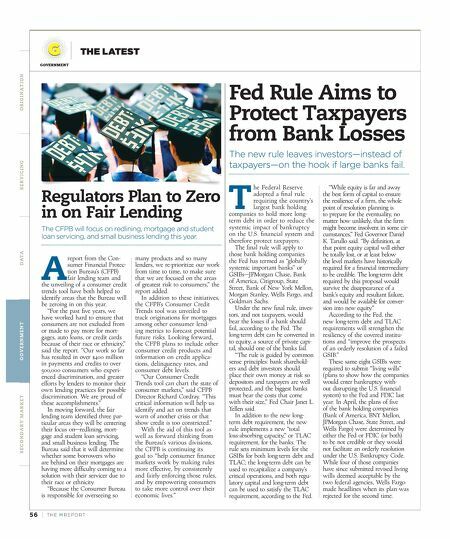 Fed Rule Aims to Protect Taxpayers from Bank Losses The new rule leaves investors—instead of taxpayers—on the hook if large banks fail. T he Federal Reserve adopted a final rule requiring the country's largest bank holding companies to hold more long- term debt in order to reduce the systemic impact of bankruptcy on the U.S. financial system and therefore protect taxpayers. The final rule will apply to those bank holding companies the Fed has termed as "globally systemic important banks" or GSIBs—JPMorgan Chase, Bank of America, Citigroup, State Street, Bank of New York Mellon, Morgan Stanley, Wells Fargo, and Goldman Sachs. Under the new final rule, inves - tors, and not taxpayers, would bear the losses if a bank should fail, according to the Fed. The long-term debt can be converted in to equity, a source of private capi - tal, should one of the banks fail. "The rule is guided by common sense principles: bank sharehold- ers and debt investors should place their own money at risk so depositors and taxpayers are well protected, and the biggest banks must bear the costs that come with their size," Fed Chair Janet L. Yellen said. In addition to the new long- term debt requirement, the new rule implements a new "total loss-absorbing capacity," or TLAC requirement, for the banks. The rule sets minimum levels for the GSIBs for both long-term debt and TLAC; the long-term debt can be used to recapitalize a company's critical operations, and both regu - latory capital and long-term debt can be used to satisfy the TLAC requirement, according to the Fed. "While equity is far and away the best form of capital to ensure the resilience of a firm, the whole point of resolution planning is to prepare for the eventuality, no matter how unlikely, that the firm might become insolvent in some cir- cumstances," Fed Governor Daniel K. Tarullo said. "By definition, at that point equity capital will either be totally lost, or at least below the level markets have historically required for a financial intermediary to be credible. The long-term debt required by this proposal would survive the disappearance of a bank's equity and resultant failure, and would be available for conver - sion into new equity." According to the Fed, the new long-term debt and TLAC requirements will strengthen the resiliency of the covered institu- tions and "improve the prospects of an orderly resolution of a failed GSIB." These same eight GSIBs were required to submit "living wills" (plans to show how the companies would enter bankruptcy with- out disrupting the U.S. financial system) to the Fed and FDIC last year. In April, the plans of five of the bank holding companies (Bank of America, BNY Mellon, JPMorgan Chase, State Street, and Wells Fargo) were determined by either the Fed or FDIC (or both) to be not credible or they would not facilitate an orderly resolution under the U.S. Bankruptcy Code. While four of those companies have since submitted revised living wills deemed acceptable by the two federal agencies, Wells Fargo made headlines when its plan was rejected for the second time.